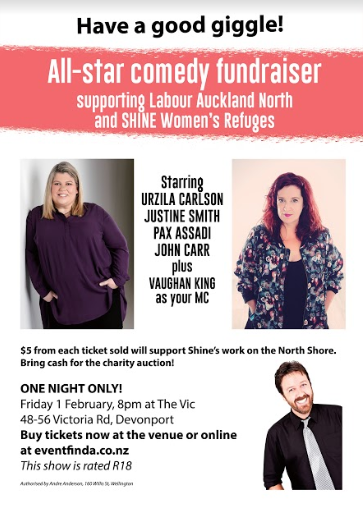 Ex-pat South African and now NZ’s own, Urzila Carlson is one of New Zealand's most loved comedians for her natural cheeky, straight up style. Since taking the comedy stage in 2008 she has racked up an impressive array of awards and has a recently completed Netflix show. Is back from the 7days live summer tour. For those who know Justine, or have seen her perform, will know she does not suffer fools gladly. Her charming and expressive performance takes her audience along the journey with her. This Christchurch girl made good, now residing in West Auckland. If you were to try and define Justine as a lover or a fighter, you'd have to say both. Pax is regarded as one of the most exciting young acts in the country by his peers and audiences alike. Pax was nominated for the Billy T Award. He has gone on to appear on a number of local television shows Including TV One's panel show ‘Word Up’, TV 3s ‘7 Days’, Maori TVs ‘Crack Up’ and a regular on the critically acclaimed ‘Brown Eye’. Better known as The Godfather of Geriatric Rap. Giving up a 55-year quest to be taken seriously, Carr joined the world of stand-up comedy in 2010 and hasn't looked back. He has become a popular performer in Auckland, has a cult following in Hamilton, and gets completely ignored by audiences in Browns Bay. Seen all around New Zealand on The Real NZ Tour … Vaughan is on the road more than most comedians so has a great down to earth connection with what is good Kiwi funny. Award winner including best M.C., best show, most offensive gag and best greenroom (Comedian to hang out with!) in the annual NZ Comedy Guild Awards.